Spring may seem far away, but it’s never too early to think about gardening. 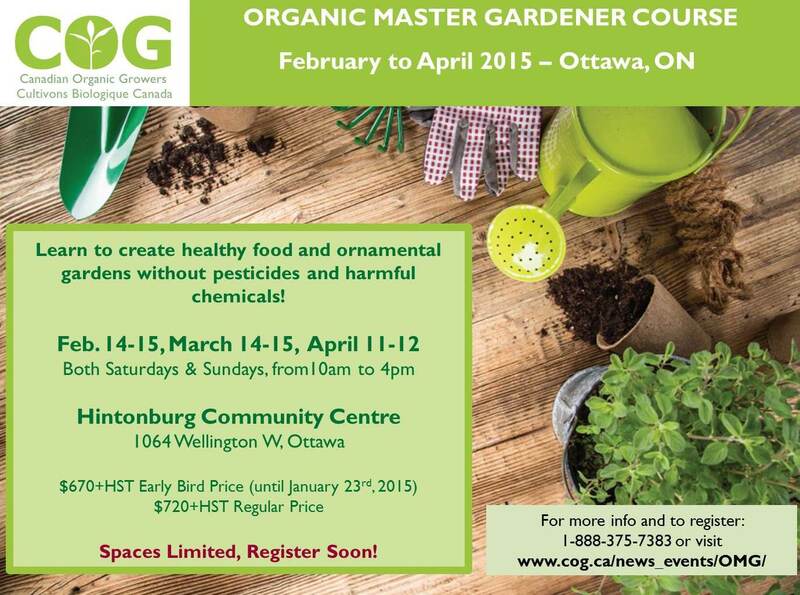 If you’re keen to delve into organic gardening or are already a savvy gardener, you might be interested in the Canadian Organic Growers’ Organic Master Gardener Course. It’s running for the first time in Ottawa, starting in February 2015. Examining the connection between soil health, plant health, human health and environmental health, this course will address sustainable land management practices to maintain plants in the urban landscape. The Organic Master Gardener Certificate is designed for urban growers, community gardeners, landscapers, municipal parks personnel, environmental advocates, naturalists and conservationists. Please note, you will need weekly access to a computer and the internet for some course materials. The course happens over three weekends—Feb. 14-15, Mar. 14-15 and Apr. 11-12, 2015—at the Hintonburg Community Centre. Early bird registration ends Jan. 23, 2015; early bird price is $670+HST; and regular price is $720 + HST. See COG’s website for further details. Canadian Organic Growers Ottawa-St. Lawrence-Outaouais also offers organic gardening seminars in April and May through their Organic Gardening in the City program. Check their website for updates.